Distributor: R1 DVD from Sentai Filmworks. Also Recommended: Sketchbook ~Full Color's~, Azumanga Daioh, Aria, Ninja Nonsense. Notes: Based on the manga by Ume Aoki, licensed in North America by Yen Press under the name Sunshine Sketch. It is currently running in Japan in Manga Time Kirara. Continuing the story from the first show -- or should I say the completely random timeline hopping from the first show, x365 starts off with how Yuno got accepted into Yamabuki High School, and continues detailing the life of her and her friends throughout the year. Cover art can sometimes be so misleading. It's what kept me from checking out this show for the longest time, and it took Tim compairing it to Sketchbook to finally make me look into it. This lead to some further comparisons to Azumanga Daioh, at which point I thought "well, why not?" One thing that piqued my curiosity, though, was that this show has obviously gotten an animation budget since last time. The first season did manage to prove that it's entirely possible to make a show-on-a-budget actually look interesting, and for good and bad, that's just what the original did. However, while x365 continues the Hidamari tradition of odd camera angles, symbolism up the wazoo and just odd animation techniques, the animation also looks a hell of a lot better now. Given that the original never looked cheap, that's actually saying something. 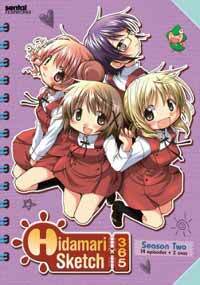 And as a reward for my patience, I've found Hidamari Sketch just delightful. For one thing, it's not a cavalcade of popular culture references played out in gags that barely leave you room to breathe. Instead, it's built around the toils and occasional absurdities of day-to-day life of a bunch of slightly eccentric people. This it does by working in human behavior-related jokes and standard physical slapstick comedy, which, when put together with the naturally flowing dialogue, has no problem coaxing the laughter out of you. A little frustratingly, that's also where it lends itself to various stereotypes, like how Miyako has to be a loud weirdo since she's a blonde. And if not that, it's how Hiro is an obsessive diet junkie just because she's not as slim as her close friend Sae. At the same time, Miyako makes up for this by not overplaying her own stereotype, but even more so because she's Yuno's best friend. Likewise, Hiro, for all her complaints, generally tends not to obsess too much about it. This is why, as with Azumanga Daioh; if you stick with it, you'll believe that these girls are good friends and generally good people. And that's the kind of bonds that makes their eccentric nature easier to accept, or even make you care about the characters themselves. Hidamari Sketch is also sentimental to a fault, and that's one of the core reasons why some people simply won't care about it. Tim mentioned episode 5 of the original in his review, which was one of the episodes I found to be the sweetest of all of them, mostly because the show broke away from the humor for a while, as it tends to do from time to time. Due to this show having no bad people, it's going to chase away viewers expecting conflicts that goes beyond the occasional quarrel between friends. In that, it's much like Aria and its almost ludicrously supportive circle of friends, tied together to the point where they are considering themselves a family in their own right. I was also initially worried about Yoshinoya-sensei, who played her cards a little close to the teachers from Mahoromatic and DearS; slightly perverted references and gags. Of course, with Hidamari Sketch being a whole lot more innocent than either of the aforementioned, her antics are usually limited to slightly dirty fantasies and cosplay antics. What made this work in my favor was that the students themselves -- even including the boys -- kept a level-headed and distant attitude towards her behavior, which was refreshing, to say the least. Thankfully, the principal is also never far away, and more than willing to reign in her antics if they get too far out of hand. Hidamari Sketch isn't the kind of show to make you die of laughter. It's probably too low-key to do that. Instead its gentle demeanor provides ample opportunities for laughs and chuckles, and together with its more heartwarming moments, it's going to make you feel pretty happy and mellow. That is, if you'll let it.